Our recent travels brought us to Washington DC where we visited my niece who is studying at Georgetown University. The visit coincided with a full moon and early on I was making plans to capture the astronomical phenomena. While researching I determined the Lincoln Memorial Reflecting Pool a suitable photo location. 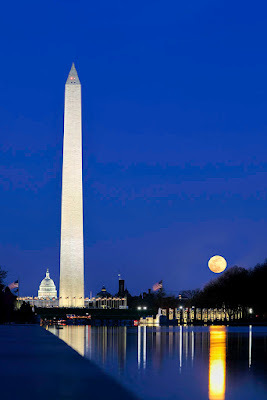 Research indicated that the moon would rise to the right of The United States Capitol and Washington Monument. Equipped with a beanbag, Canon Mark IV, 100-400mm telephoto lens with a 1.4x extender I embraced the challenge of yet another moon rise photography adventure. To my surprise, I was not on my own. There were hundreds of people and plenty of other photographers that had the same thought. I aborted my initial spot as The United States Capitol and Washington Monument were overlapping and it felt very clustered. While moving towards the monuments I find a composition that separated the two landmarks and provided room for them to breath. The next challenge was to be patient and minimize people in the foreground to the left of photograph. Luckily there was a big gap of folks walking the National Mall and I was able to blur some out during the long exposure. 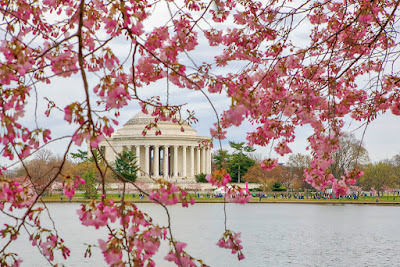 Next day I continued the fun by photographing early cherry blossoms around the Tidal Basin and the Thomas Jefferson Memorial.